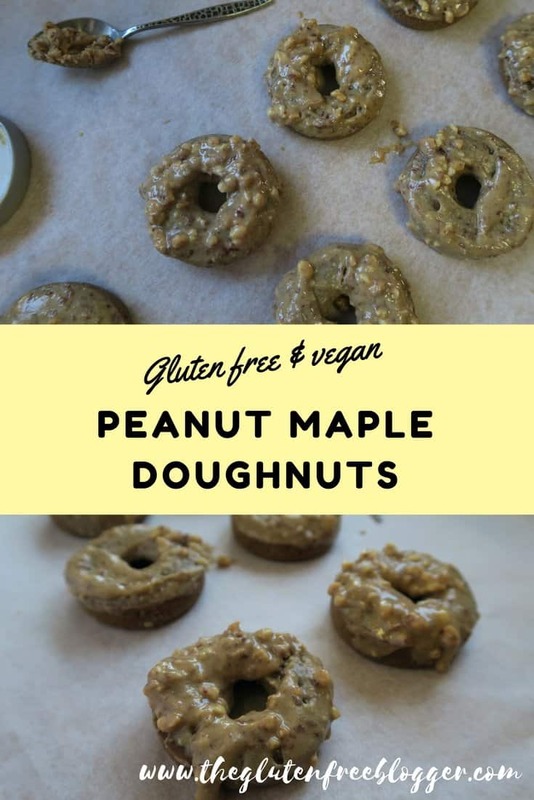 Picture the scene: Thick, sweet peanut butter glaze dripping down a freshly baked, super light doughnut; the delightful crunch of the peanut pieces as you bite into it – and all gluten free, dairy free, wheat free, egg free and vegan. 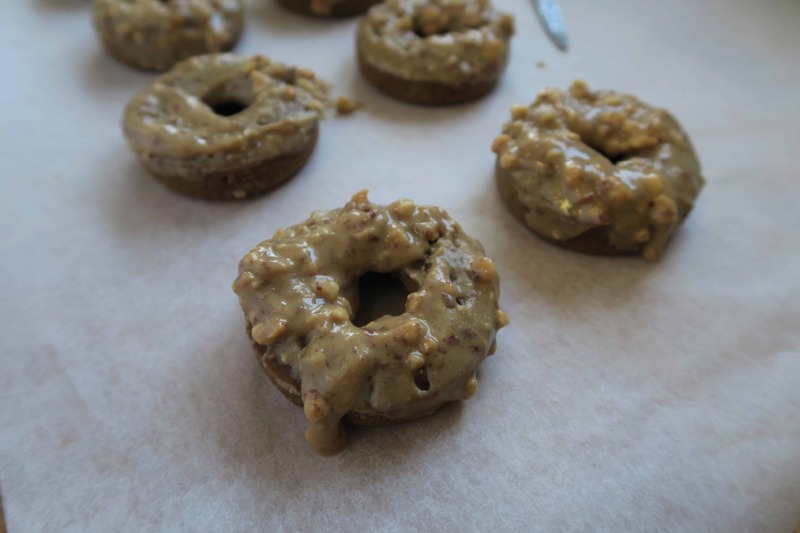 Yes, my friends, today I bring a little slice of HEAVEN with these amazing gluten free maple peanut glazed doughnuts. And to make it even better, they are less than 200 calories each, refined sugar free, and a perfect pre- or post-workout snack if you’re craving the sweet stuff. I’ve been meaning to buy a doughnut tin for AGES, after me and Lauren made Christmas doughnuts as part of Vlogmas – so when I found one half price in Sainsbury’s this week, that was that. 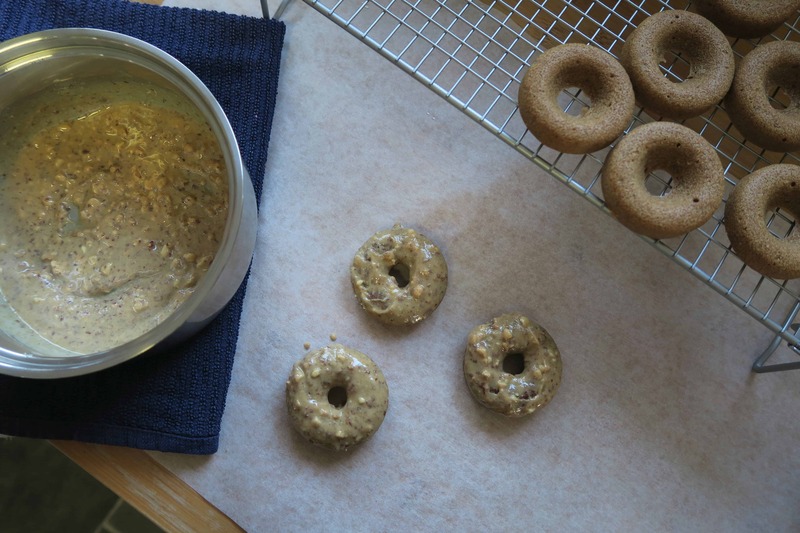 In fact, this recipe is loosely based off the doughnuts Lauren and I made before from her own recipe, which you can find here. I used the same sort of base, but substituted a few ingredients. I used a chia seed egg replacement rather than flaxseed as it was all I had, and I thought it added a great texture to it. 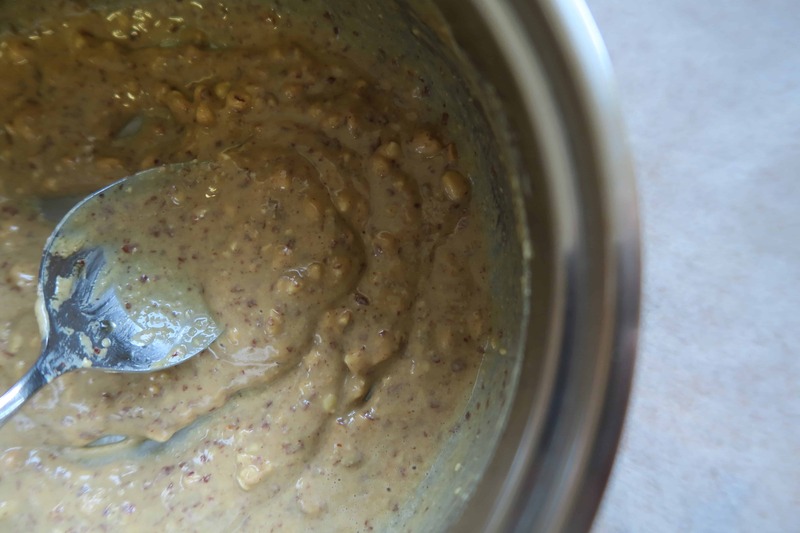 I decided to try teff flour instead of buckwheat – and I was really pleased with the result. I have never used teff before, it’s an ‘ancient grain’ which is gluten free, and I bought some of it by Dove’s Farm to try. It has a nice taste and texture, which worked well in this recipe. 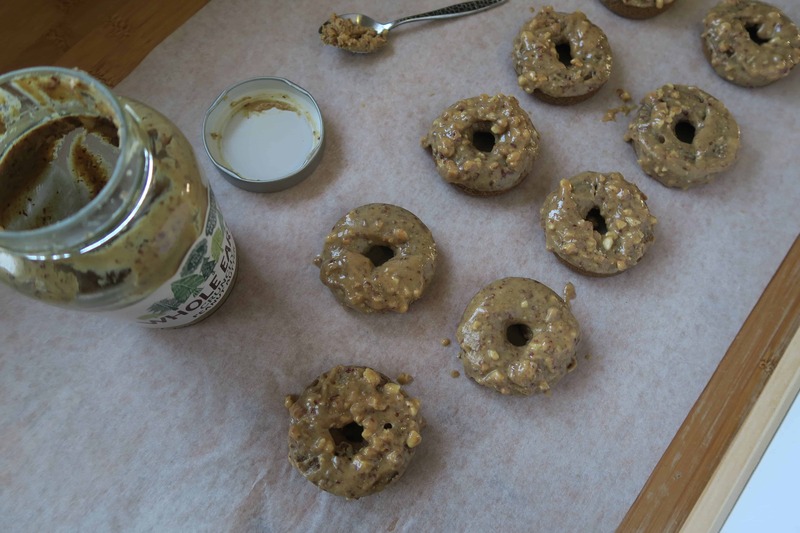 I also knew I wanted to create something involving nut butter for the glaze! It had to be sweet and sticky and after a few failed experiments (which ended up in the bin) and burning my tongue (why lick the spoon when you KNOW it’s hot!?) 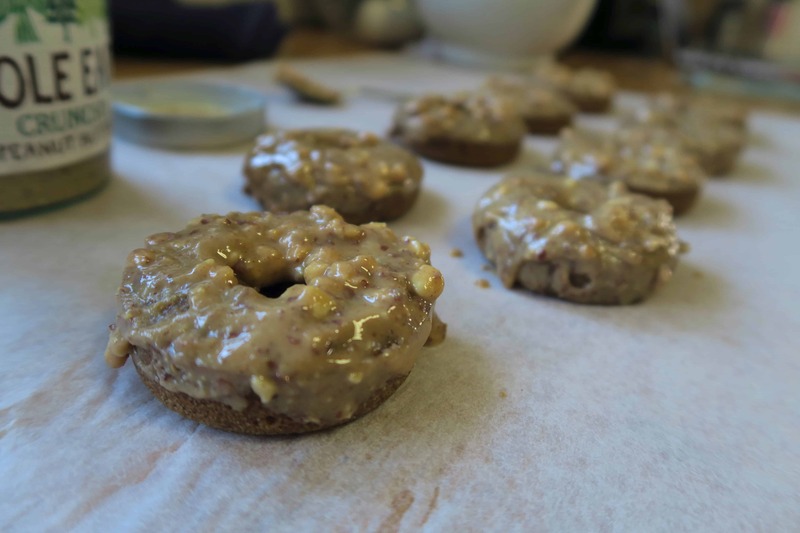 I have cracked it with this simple maple peanut butter glaze. I could just eat it on its own! 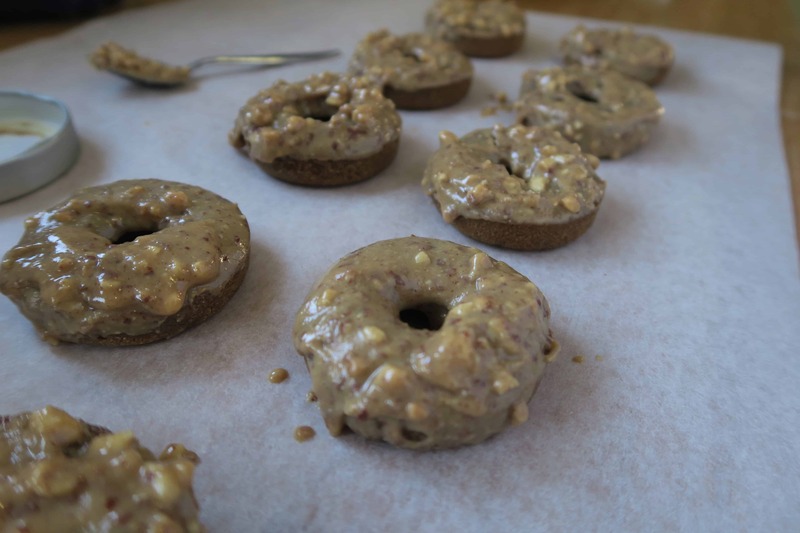 I can’t wait to make more doughnuts over the coming weeks – this recipe has me well and truly hooked and I’m already thinking of some new and exciting flavour combinations to test out. They are so much easier to make than I thought which is great. What flavours would you like to see next? Leave me a comment below and let me know! Macros per serving (for 9 doughnuts): 190 cals; 11.5g fat; 22g carbs (12.7g sugar); 3.5g protein. Gluten free, egg free, dairy free, wheat free, vegan. Mix all of the dry ingredients (flour, coconut sugar, baking powder, cinnamon) in a large mixing bowl. Meanwhile, make the glaze. Add the peanut butter, maple syrup and coconut oil to a pan and heat gently. Stir often so that it combines to form a thick glaze, and once heated remove from the heat and allow to cool for a minute or two. 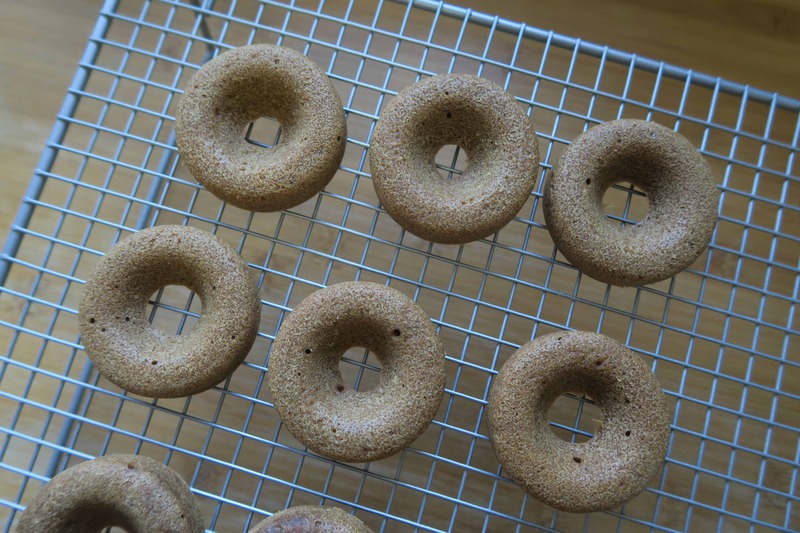 Dip the doughnuts into the glaze, ensuring a neat covering. You may need to dip them twice – leaving to set a bit in between – or I used a spoon to distribute the rest of the glaze between doughnuts. Because I used crunchy peanut butter, this was easiest, but smooth peanut butter would create an easier dipping system! What are your favourite doughnut toppings and flavours? 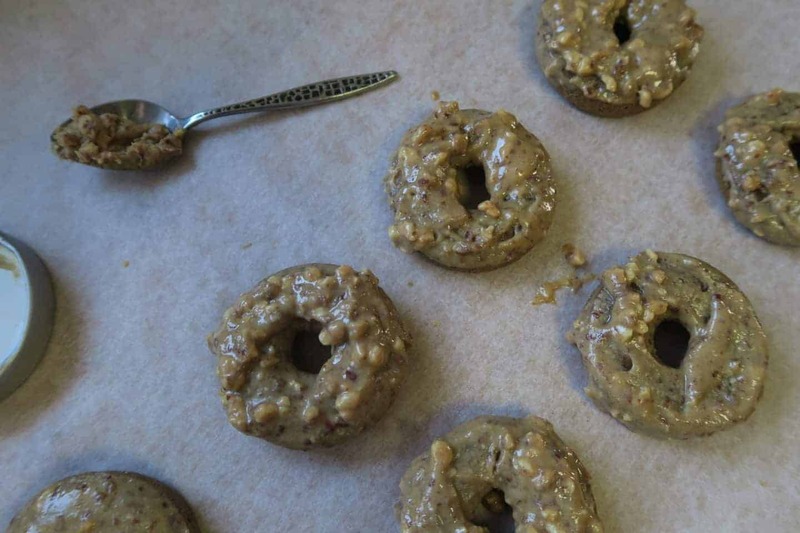 If you make these doughnuts or have a recipe to share, make sure you follow me on Facebook, Twitter or Instagram and tag me in your creations – I love seeing them!